I am always in a quest to balance my life of working full time, keeping a full time business up and running, keeping our home organized and clean, and finding time for those little pleasures of life. It feels like i need to throw in the major factor of limited levels of energy too. I don’t know about you, but there are times when there is no energy left but there is alot to do. provided a visual way of tracking your satisfaction level in 10 areas of your life. Quickly you can see where the low satisfaction is, and perhaps direct energy and time to those areas to bring them up. If you are interested in the article click on the title, which i have linked to their website. Money / Finance – this is getting better, but has been a stressor. 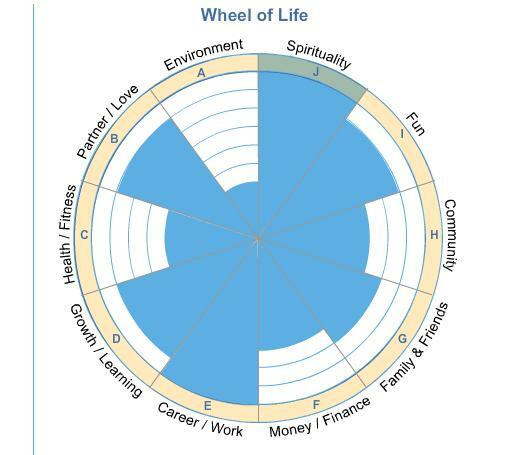 So that is what i am working on this week… improving my wheel, by improving areas that are at a deficit on the wheel! one day this balancing act will get easier… and more second nature… i hope that day is soon!